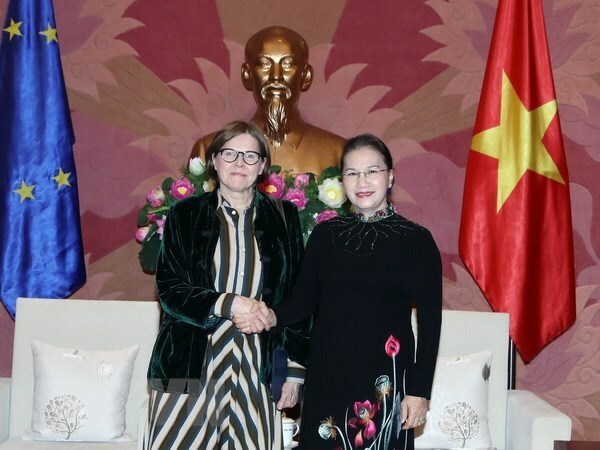 Hanoi (VNA) – National Assembly (NA) Chairwoman Nguyen Thi Kim Ngan’s upcoming working trip to the European Parliament (EP) is expected to help develop friendship and cooperation between the Vietnamese NA and parliaments of EU member countries. During the visit, made at the invitation of EP President Antonio Tajani, the Vietnamese top legislator will discuss parliamentary collaboration between Vietnam and the EP and EU member countries, as well as the ties between the Association of Southeast Asian Nations (ASEAN) and the EU. Bilateral, regional and international issues of common concern will also be tabled. The trip is the first made by a Vietnamese NA leader to the EP after eight years. Vietnam and the EU have coordinated closely at multilateral forums and international organisations, especially within the framework of the ASEAN-EU cooperation mechanism, the ASEM and the UN, and in addressing global issues such as climate change, sustainable development, energy security, counter-terrorism and non-proliferation of weapons of mass destruction, and illegal migration. Germany, the UK, the Netherlands, Italy, France, Spain, Austria and Belgium are Vietnam’s largest export markets in the EU, with annual turnover exceeding 1 billion USD each. Vietnam’s main exports to the markets are textiles and garment, footwear, coffee, seafood, computers, and phone components. The two sides have completed their negotiations of the EU-Vietnam Free Trade Agreement (EVFTA). The relations between the Vietnamese NA and the EP have been growing robustly to become an important pillar in the Vietnam – EU ties. Regular delegation exchanges, dialogues, and meetings between parliamentarians at multilateral parliamentary forums have contributed significantly to the sides’ engagement. The two parliaments also established their bilateral friendship parliamentarians’ groups.